Pseudoaneurysm of ascending aorta is an infrequent but well-recognized and potentially fatal complication after cardiac surgeries. The pathology of pseudoaneurysm includes weakness of either layer of the aortic wall, resulting in disruption of the layer of the wall of the aorta and covered by the remaining vessel layers and/or the surrounding structures. The potential sites for development of pseudoaneurysm after surgery involving the ascending aorta are valvulotomy site, clamping site, graft anastomosis, needle site and cannulation site. ,,, Reasons for development of pseudoaneurysm include technical error, acute dissection, native tissue degeneration or deterioration of the graft or suture material. The complication can develop early, delayed or late. The presentation is varied, from myocardial ischemia due to coronary compression, due to compression of the esophagus, pulsatile mass over thorax, ulceration of the skin with bleeding, embolic complications, features due to infection in pseudoaneurysm and catastrophes due to rupture of this pseudoaneurysm. With the technical advancement in computed tomography (CT) scan and magnetic resonance imaging, it is now possible to determine the precise location, origin, dimension and extension of the pseudoaneurysm. Although there has been significant improvement in surgical, anesthetic, cardiopulmonary bypass technique and postoperative management, the outcome of the surgical management of the pseudoaneurysm remains the same. ,, Various interventional methods has been tried with varied success rates to address the condition. , We are presenting two cases of ascending aorta aneurysm developed after cardiac surgery managed successfully with placement of ASD occluder, which occurred following coronary artery bypass surgery and following double-valve replacement surgery. The first case is of a 57-year-old man who has undergone elective coronary artery bypass grafting for triple-vessel coronary artery disease and required sternal resuturing for sternal wound infection after 1 month of surgery. After 2 months of surgery, an angioplasty was performed to mid-LAD for 95% stenosis in the segment. Later, after 1 month, he was readmitted with repeated episodes of bleeding from the sternal wound and a small pulsating membrane at the upper part of the sternal wound. He was in congestive cardiac failure at the time of presentation, with bilateral pedal edema and crepitations in the chest. 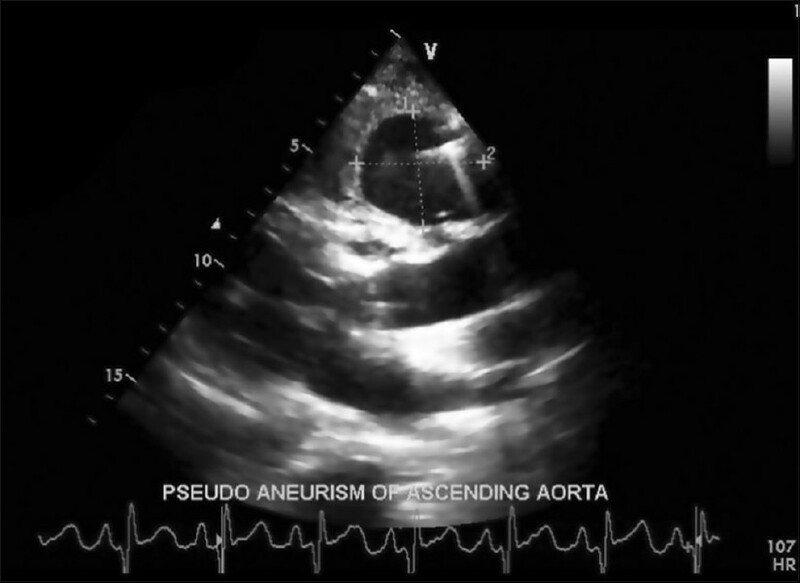 A transthoracic echo was done that showed a 40 mm × 44 mm pseudoaneurysm [Figure 1] arising from the ascending aorta. 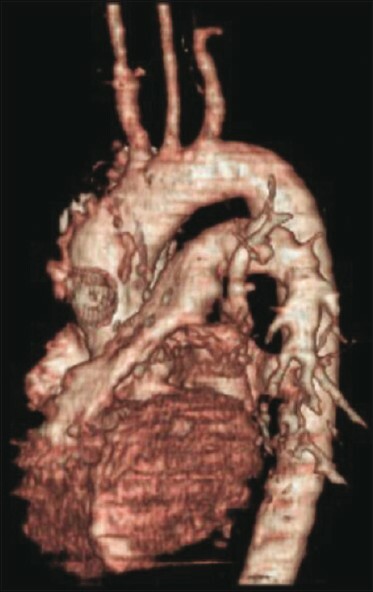 A CT angiogram of the chest showed a large trilobed and partially thrombosed pseudoaneurysm from the ascending aorta [Figure 2] with a narrow neck (9.0 mm), which was abutting the sternum and extending into the left parasternal region and compressing the right ventricular outflow tract and main pulmonary artery. The distance of origin of the neck measured 36 mm from the right coronary origin. After assessing the comorbid condition and the risks of redosternotomy for surgical management, the interventional management by occlusion of pseudoaneurysm opening with ASD Occluder was planned. The left femoral artery (6 F) and left femoral vein (7 F) accesses were obtained. Aortic angiogram was performed with a pigtail catheter (6F, merit), which demonstrated the trilobed pseudoaneurysm with a narrow origin from the ascending aorta, as shown by CT angiography. 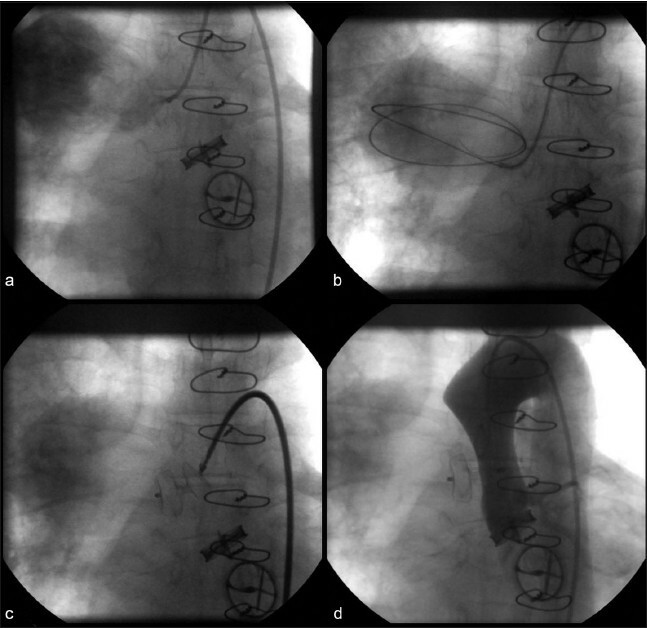 A right coronary angiographic catheter (Judkins Right Coronary, JR2) was used to engage the orifice of the pseudoaneurysm and selective hand injection was carried out to delineate the pseudoaneurysm anatomy. An exchange length 0.035" J tip Terumo wire (Terumo™) was then positioned into its middle lobe using a catheter. A 9 F ASD Occluder delivery sheath (Searcare, Lifetech Scientific(Shenzhen) Co., LTD, China) was then railroaded over this Terumo wire with its tip in the pseudoaneurysm. The ASD Occluder device was selected based on the size of the neck, which measured 9 mm. A 12 mm ASD Occluder (Seercare, Lifetech Scientific(Shenzhen) Co., LTD, China) spanning the middle lobe and the neck of the pseudoaneurysm and the angiogram showed no residual leak [Figure 3]. The patient made an uneventful recovery with a postprocedure CT scan demonstrating complete occlusion of the neck of pseudoaneurysm [Figure 4] and collapse of the walls of pseudoaneurysm over the device. The features of congestive cardiac failure also improved over the next 5 days with medical support. The 6-month follow-up echo showed device in position and no residual flow across device. A 35-year-old male who had undergone double-valve (Medtronic Hall™ valve; aortic valve 21 mm and mitral valve 24 mm) replacement for rheumatic involvement of valves presented with chest pain on exertion after 2 years of surgery. Echocardiogram showed mean mitral inflow gradient of 4 mmHg and mean aortic outflow gradient of 12 mmHg. A pseudoaneurysm was seen arising from the ascending aorta, measuring 45 mm × 50 mm, filling with each systole with self-contrast in the sac. 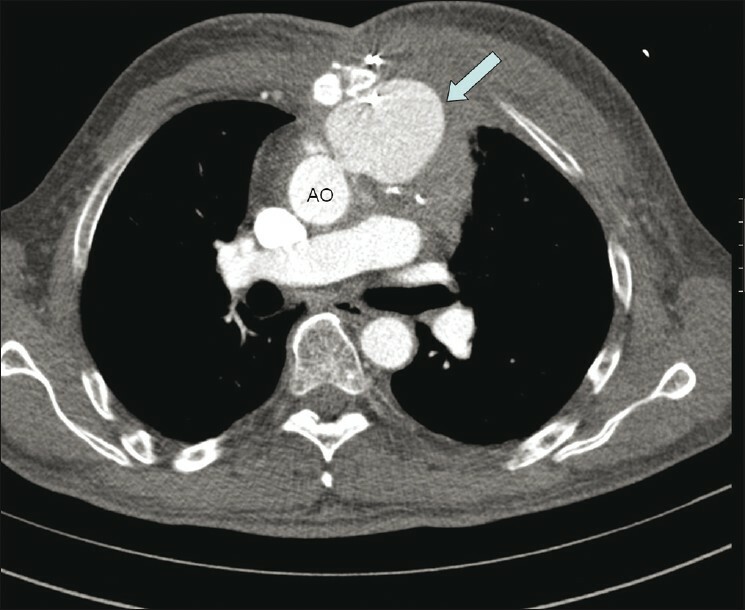 CT angiogram was done, showing the pseudoaneurysm with a narrow neck (7 mm) from the ascending aorta [Figure 5] and origin 46 mm from the aortic annulus and 20 mm from the right coronary origin. During catheterization, aortic root injection was performed first to confirm the anatomy. 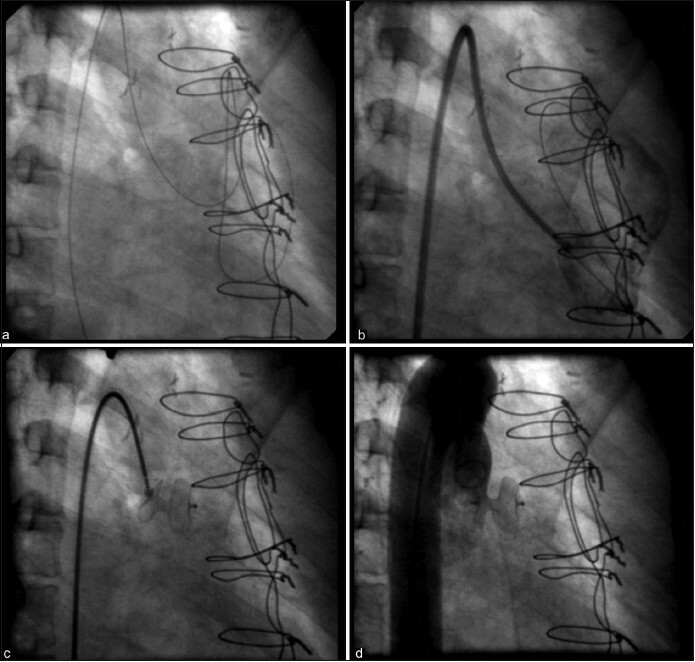 The neck of the pseudoaneurysm engaged with a 6 F right coronary artery catheter (Judkins Right Coronary, JR2) and 0.025" J tip Terumo wire (Terumo™) was positioned in place. A 7F PDA device delivery sheath (Lifetech Scientific(Shenzhen) Co., LTD, China) guided over the wire [Figure 6]. A 10 mm ASD Occluder (Seercare, Lifetech Scientific(Shenzhen) Co., LTD, China) was then deployed occluding the neck with disks on either side. The aortic root angiogram after device deployment showed no residual flow, with good flow in the coronaries. The 2-month follow-up echocardiogram showed no residual pseudoaneurysm sac and mean aortic outflow gradient of 12 mmHg. CT angiogram was done after 2 months, which showed device in position with no residual contrast flow to the pre-existing pseudoaneurysm sac [Figure 7]. While the surgical management is the standard treatment, the consideration to intervention should always be given. Low-procedural morbidity is an added advantage, especially where the general condition of the patient does not permit surgery. Moreover, because the pseudoaneurysms develop mostly in the postsurgical condition, where the adhesions require lengthy and meticulous tissue dissection, a constant issue in surgical management. ,, Various case reports have shown promising immediate- and short-term outcomes. Intervention techniques including coil embolization and thrombin injection in the sac of pseudoaneurysm have also been tried with some complication, but the septal occluder use to occlude the neck of the pseudoaneurysm has shown better results. ,,,, No fatal complications have been reported in any report. ,, The anatomical definition of the pseudoaneurysm should be adequately assessed using the available imaging modalities, including size of sac, presence of thrombus, relationship to the surrounding structures, size of communication between the sac and the vessel and presence of other pathologies that require surgical attention. The prerequisites of successful device occlusion would be presence of a relatively narrow communication between the aorta and the pseudoaneurysm, distance from important vessels to ensure placement of the device without obstructing the origins of branches or coronary origins and a spacious sac of the pseudoaneurysm that would allow good positioning of the wire and the sheath to accommodate the disc of the device. The potential procedural and postprocedural complications could be rupture of pseudoaneurysm during wire placement or delivery of the device as the wall of the aneurysm is formed by the one or two stretched layers of the vessel or even hematoma. Pseudoaneurysm from the ascending aorta, which is a potentially fatal complication following cardiac surgery, can be safely and effectively managed by transcathter closure using atrial septal occluder in the presence of a narrow origin, with excellent immediate- and short-term outcomes. 1. Sullivan KL, Steiner RM, Smullens SN, Griska L, Meister SG. 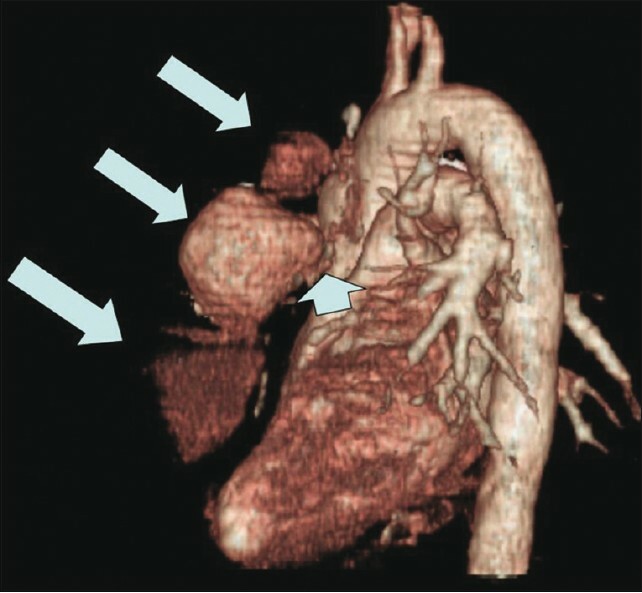 Pseudo aneurysm of the ascending aorta following cardiac surgery. Chest 1988;93:138-43. 2. Razzouk A, Gundry S, Wang N, Heyner R, Sciolaro C, Van Arsdell G, et al. Pseudo aneurysms of the aorta after cardiac surgery or chest trauma. Ann Surg 1993;59:818-23. 3. Mulder EJ, van Bockel JH, Maas J, van den Akker PJ, Hermans J. Morbidity and mortality of reconstructive surgery of noninfected false aneurysms detected long after aortic prosthetic reconstruction. Arch Surg 1998;133:45-9. 4. Misra S, Koshy T, Patro SN, Dash PK. Large pseudoaneurysm of aortic root after aortic valve replacement for rheumatic heart disease: A rare complication. Ann Card Anaesth 2009;12:152-3. 5. Dougenis D, Daily BB, Kouchoukos NT. Reoperation on the aortic root and ascending aorta. Ann Thorac Surg 1997;64:986-92. 6. Lin PH, Kougias P, Huynh TT, Huh J, Coselli JS. Endovascular repair of ascending aortic pseudoaneurysm: Technical considerations of a common carotid artery approach using the Zenith aortic cuff endograft. J Endovasc Ther 2007;14:794-8. 7. Lin PH, Bush RL, Tong FC, Chaikof E, Martin LG, Lumsden AB. Intra-arterial thrombin injection of ascending aortic pseudoaneurysm complicated by transient uschemic attack and rescue with systemic abciximab. J Vasc Surg 2001;34:939-42. 8. Chapot R, Aymard A, Saint-Maurice JP, Bel A, Merland JJ, Houdart E. coil embolization of an aortic arch false aneurysm. J Endovasc Ther 2002;9:922-5. 9. Kanani RS, Neilan TG, Palacios IF, Garasic JM. Novel use of the Amplatzer septal occluder device in the percutaneous closure of ascending aortic pseudoaneurysms: A case series. Catheter Cardiovasc Interv 2007;69:146-53. 10. Hussain J, Strumpf R, Wheatley G, Diethrich E. Percutaneous closure of aortic pseudoaneurysm by Amplatzer occluder device-case series of six patients. Catheter Cardiovasc Interv 2009;73:521-9. 11. CB, Burch G, Tripathy U, Slater MS, Song HK. 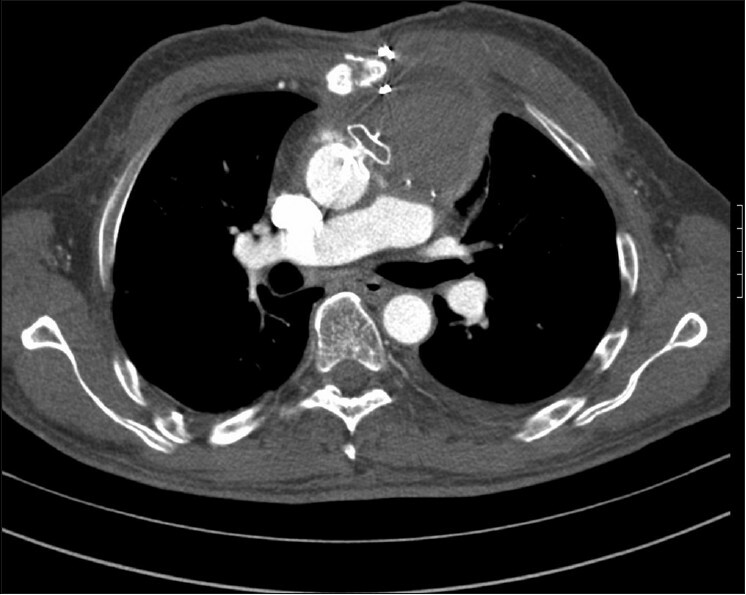 Percutaneous repair of an ascending aortic pseudoaneurysm with a septal occluder device. J Thorac Cardiovasc Surg 2005;130:603-4.